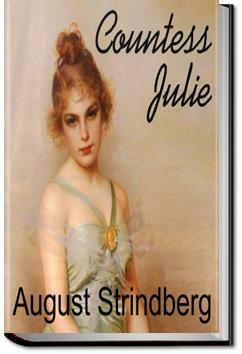 Countess Julie: August Strindberg’s naturalistic one-act drama has only three characters: Julie, a passionate young noblewoman; Jean, her father’s ambitious valet; and Kristin, the cook, who is also Jean’s fiancee. The play is set on Midsummer Eve, when everyone is reveling, and Julie and Jean get a bit too intimate – with tragic results. LAURA. Exactly. It is, therefore, my painful duty to tell you the whole truth immediately. DOCTOR. Shouldn't we postpone this conference until I have had the honor of being introduced to the Captain? LAURA. No! You must hear me before seeing him. DOCTOR. It relates to him then? LAURA. Yes, to him, my poor, dear husband. DOCTOR. You alarm me, indeed, and believe me, I sympathize with your misfortune. LAURA [Taking out handkerchief]. My husband's mind is affected. Now you know all, and may judge for yourself when you see him. DOCTOR. What do you say? I have read the Captain's excellent treatises on mineralogy with admiration, and have found that they display a clear and powerful intellect. I read one reviewer who said Strindberg turns you inside out. Very true. Both Countess Julie and The Father are wonderfully drawn pictures of some of the conflicts between the sexes. Of course it doesn't have to be like this. Really enjoyed The Father and Countess Julie, not so sure about The Outlaw and The Stronger but still worth a read, and I will definitely try to see some of his plays performed.